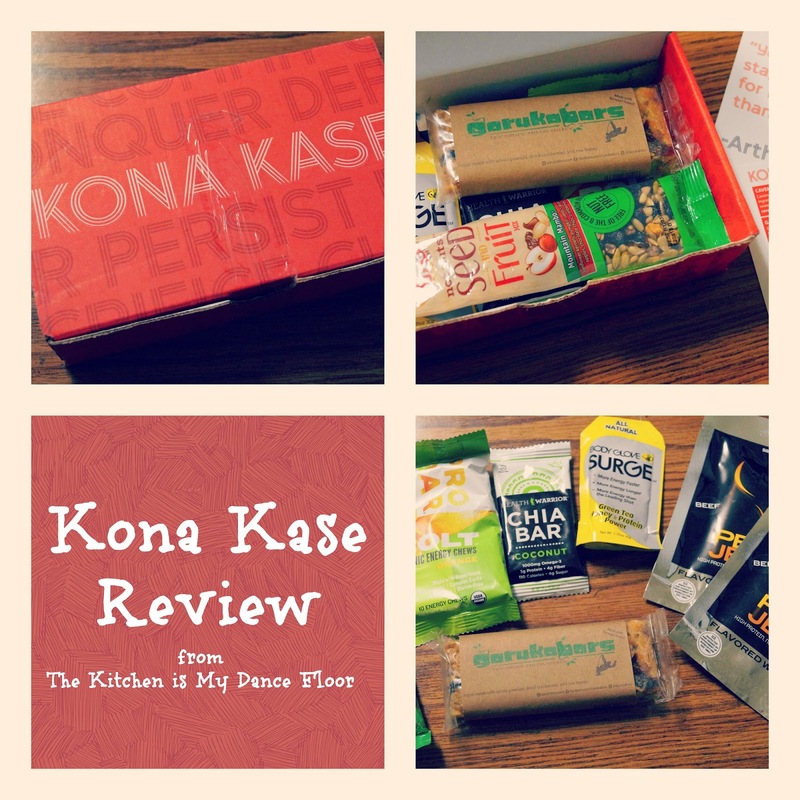 The Kitchen Is My Dance Floor: Kona Kase Review - Perfect for Active Lifestyles! Kona Kase Review - Perfect for Active Lifestyles! Last month we received the July Kona Kase to review. Kona Kase is a monthly subscription service filled with products that are perfect for your active lifestyle! With the hubby and I really trying to work-out more, eat better and over-all have a healthier lifestyle - I thought Kona Kase was a perfect fit. Our box was filled different snacks that we hadn't seen before...we both loved the Garuka Bars (they are so good), Chris was all over the Enjoy Life snacks and I really liked the Perky Jerky! I love the Kona Kase story - It’s May 2012. We were running the Relay (200 team relay from Calistoga, CA to Santa Cruz, CA) and found ourselves sitting in the back of an Econoline van eating tortilla chips and slices of provolone cheese to fuel up before the race. We were tired of eating the same old boring energy bars, but finding similarly healthy alternatives wasn’t easy. Everyone on our team was talking about these great but relatively small or unknown brands they had heard of but couldn’t find. We knew there had to be a better way to discover awesome nutritional products than scouring local health shops or fitness websites or reading tons of product reviews and nutritional labels trying to separate the good from the bad. We wanted to create a platform where runners, cyclists, swimmers, and yoga/Crossfit aficionados could sample different brands from around the country to find what works best for them. And so, Kona Kase was born. You can get your own case starting at $15 a month - get big discounts for ordering 3.6 and 12 month shipments. Kona Kase is perfect for runners or anyone that is tired of the same old protein bars you find in the grocery store. From Kona Kase: Every month, we deliver you top tier nutritional products to help you achieve their nutritional and fitness goals. Whether you simply want to learn to run a mile without passing out or you’re training for your third Ironman Triathalon, we’ve got you covered. We taste, we test, and we send only the best right to your door step. If we don’t love it, you don’t get it. Visit Kona Kase online to order your own box - you won't be disappointed with these! AND....just for you.....click on THIS LINK and you can get $5 off your first purchase! Making your first box just $10!